New Book--"Anti-Capitalist Poetics in Action"
Still working on health, which is why I haven't posted here in so long. And it is political poetry that I started writing after I read The Communist Manifesto for the first time--very late in life! I fell in love with the beautiful poetic language in The Manifesto--and the clarity and truth of its message. I said to myself, "If Marx and Engels can bring poetry to their economics, what would happen if I tried to write their economics into my poetry?" 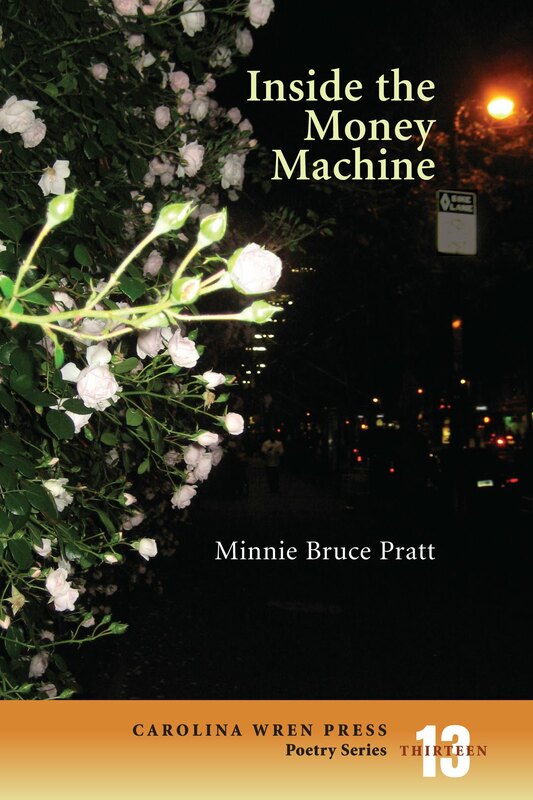 Inside the Money Machine is the result--poetry for the "immense majority'—for those who work for a living, out of the house or at home, from the laundromat to the classroom, from the blue-collar construction sites to the white-collar desk jobs. These fresh, gritty and passionate poems are about the people who survive and resist inside "the money machine" of the 21st -century capitalism. 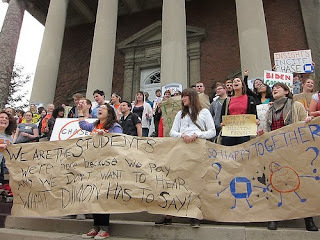 “Take Back Commencement Rally” at SU Against Banks! Whose voice comes through me now? For years I just repeated the words. jobs? Where will they live? Their cars? monopoly capital in control of the board. raising the questions: And whose work done? What do we want from our opposable thumbs? walls, set inside our work’s locked-up worth. Now these young hands up, demanding halt. In what ways are corporate interests and the goal of profit-making determining the process of education now? How is the profit-making of capitalism actually closing down paths of questioning and rejecting attempts to look at new ways of shaping a more just future? In 2005 JP Morgan admitted that in its earlier form it had profited from the heinous U.S. slave trade—that it had actually held as property 1250 enslaved people. Lawyers working on a class action suit against Morgan & similarly implicated U.S. banks and corporations estimate that their total profits from the slave trade would amount to over $2 trillion today. Those who fought to abolish slavery in the U.S.—abolitionists—were shouted down and attacked and told slavery was unchangeable—but slavery was ended. Human beings ended slavery through cataclysmic struggle. “bread and roses” for all—food, homes, jobs, health care, and friends, poetry and dancing! How do we get there? We keep organizing! May 1st Rally in Union Square, New York City, for jobs and all rights for immigrants! Bank Out People Not Banks! Stop the war at home! Stop all foreclosures! Stop attacks on women’s reproductive rights and LGBT lives! Stop the budget cuts! Cancel all student debt! A job is a right! Stop, stop, stop the profit war on people!! There has been an increasing right-wing campaign of hate in the U.S., led by the so-called "Tea Party" movement. I grew up as a white girl and young woman in the segregated South in the 1950s and 60s. I can tell you that the racist, anti-gay, and anti-woman language and actions of this neo-facist group is shockingly familiar to me from that violent era, when the powers-that-were, the ruling white elite, preached their supremacy. Only mass action, led in even the smallest towns and rural counties by people from the Black community, ended segregation. Public mass action is what is needed today to end the hateful scapegoating message of this current right-wing campaign, and to point to the corporations, banks, and system of profit that are actually responsible for the dire economic crisis casting so many people into fearful conditions. Join the rally against neo-fascist hate in Buffalo, NY, tomorrow (4/12) sponsored by the International Action Center. Leslie and I plan to drive over (hir health permitting) and hope to see and meet you there, with others in the area! 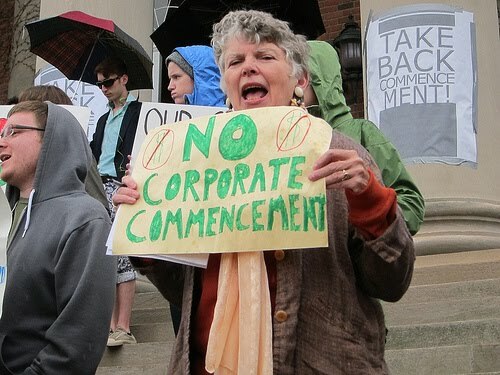 Students Fight to Stop Bank "Takeover" of Graduation. visit their Facebook page: "Take Back Commencement"
Celebrate International Working Women's Month! To celebrate, I'm putting up my first entry on this blog! "1970: Reviving the Fighting Spirit of International Women's Day"